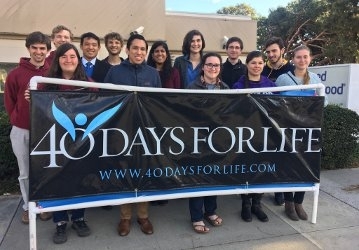 As part of their Lenten observance, as many as 50 Thomas Aquinas College students have taken part in the 40 Days for Life prayer vigils outside the Ventura, California, Planned Parenthood. “I talked to the people running the campaign locally, and they said it would be great if we could do a couple of hours for one afternoon a week,” says junior Ryan Uchison, who organizes the student contingent. “I got thinking, between us all — even though the intellectual life is our primary goal — we could do a lot more than that.” So he began to schedule vigil shifts, recruit volunteers, and find drivers to make the 20-mile trip. As a result, for the last four Thursdays, Thomas Aquinas College students covered the entire day’s shifts, from morning to night. Additionally the group also distributes information for pro-life crisis-pregnancy centers and health clinics that offer women’s medical services without engaging in the grim practices of Planned Parenthood. “We stand out there, we pray, we hold signs, and we bear witness to the wonderful life-giving message of 40 Days for Life,” says Ryan.